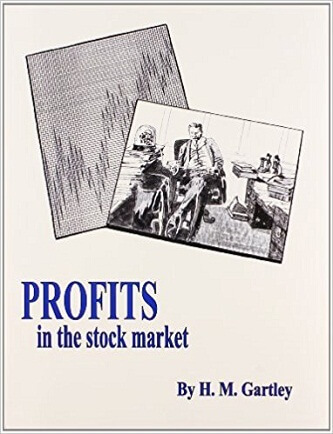 Gartley’s Stock Market Experience Tables, a full 123 page addition to the already large-Profits in the Stock Market makes this 474 pages of a book. Written in 1940, Gartley provides us with a complete study of what he calls Relative Velocity, which we now call Relative Strength. Two full books in one, complete with a full packet of charts. Profits in the Stock Market is more of a course in chart reading and stock trading, it comes with nearly 40 historical charts to refer to. We believe that Mr. Gartley and Mr. Gann may have known each other and although the chart reading and interpretation techniques within this book are different than what Mr. Gann teaches, there are moments of similarity that may help unlock some of Mr. Gann’s teachings. Still, this book stands on it’s own as one of the greatest chart reading and interpreting masterpieces of all time. Techniques taught can be applied to commodities. Due to the size of this book, including the large package of charts that come with it, this book should really be considered a course on chart reading. Before being republished in 1981, copies of this 1935 classic were selling for $1800. Now the same text and very large package of accompanying charts are available again. In fact, the chart package alone is worth many times the cost of the book. This is one of the classic books written on the art of chart reading, chart interpretation and stock trading. The fundamentals Mr. Gartley explains are as valid today as when they were formulated. Plus, the techniques taught can be applied to commodities trading, with some slight modification. Put the tested logic of this highly successful trader and this highly acclaimed book to work for you. A book/course that will compliment Mr. Gann’s teachings. and much more. The Chart package includes nearly 40 large charts to follow and study. Truly a remarkable find for the serious trader.